Carving its way into the rugged coast of South Island, Milford Sound marks the moment where the cobalt-blue rollers of the Pacific Ocean mingle with the soaring peaks of the Fiordland National Park. Rudyard Kipling hailed the great canyon as the eighth wonder of the world, and it's estimated that just shy of one million tourists pass this way each year today – meaning it's perhaps the most-visited of all New Zealand's wildernesses. Tailor-made for travelers with a penchant for all things wild, Milford Sound cruises focus on the unique flora and fauna of the Fiordland. Taking around two hours in total, they cover the whole length of the sound, from the wharfs in the east to the Tasman Sea in the west. Experienced guides are at hand to reveal the secrets of the South Island climate, and the fantastical array of creatures it supports between the glacial peaks and the icy waters. Lucky passengers will spot dolphins and fur seals, see multi-colored tropical birds flitting over the canopies, and learn all about the virgin forestry of these remote valleys. 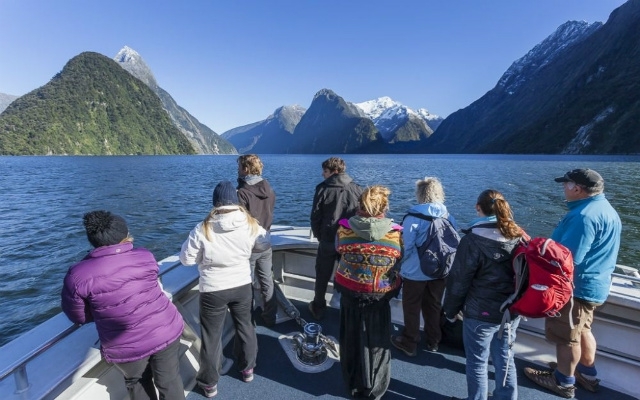 Some of the most acclaimed Milford Sound nature cruises are run by Southern Discoveries, whose local guides and wind-blasted viewing platforms are perfect for making the most of the wilds. 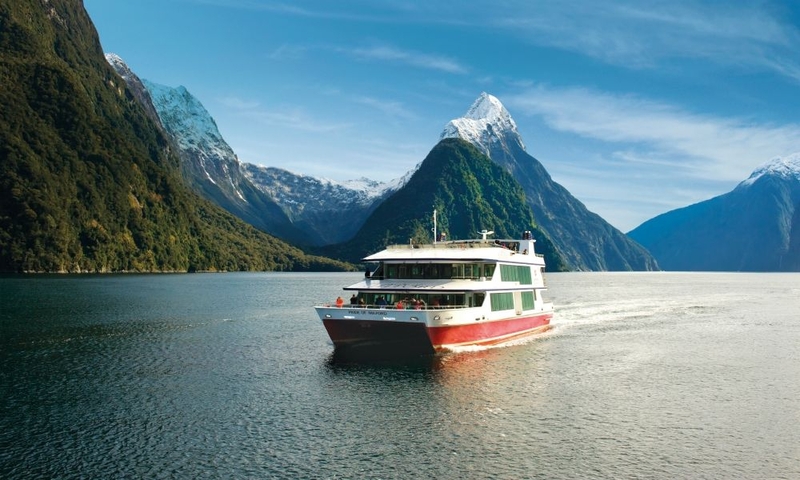 If it's the fabled beauties of the Milford that's enticed you to this southern enclave of NZ, then there's perhaps no better option than the scenic cruise. Taking in everything from the wispy cataracts of the Lady Bowen falls to the crashing wall of mist that is the Stirling Falls, they pass all the greatest wonders of the valley. Look up and you'll spy out the cloud-shrouded spire of Mitre Peak, backed by the pearly white of Pembroke Glacier. Look to the water and you'll see shimmering reflections of the Southern Alps, or the elegant outlines of dolphin pods. Lunch is offered on board, and includes everything from Indian thali plates to Kiwi buffet choices. 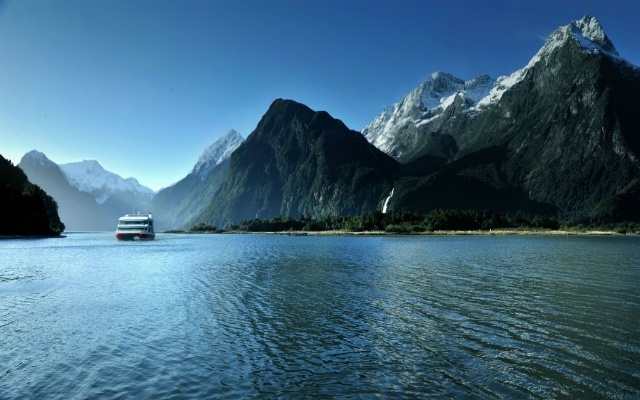 Some of the top scenic trips are run by Mitre Peak Cruises, lasting around two hours and taking in all the soaring massifs between the Southern Alps and the rollers of the Tasman Sea. Meanwhile, Go Orange offer a fusion of scenery and nature on their trips, balancing encounters with penguins with photograph opportunities beneath the rock walls of Milford. 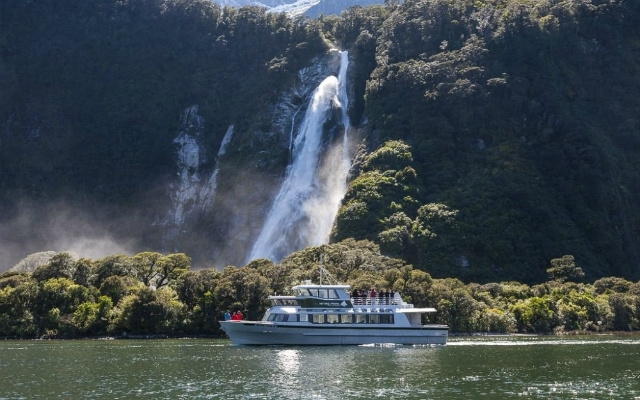 The most comprehensive of all Milford Sound cruises comes in the form of the two-day overnight package aboard the Milford Mariner. Travelers depart in the late afternoon and cover the entire length of the fjord on the first evening. Dedicated guides are at hand to reveal the curious natural wonders of the region, pointing out the rare fauna and flora of the surrounding banks. For the sunset, the boat anchors up in an empty cove and passengers settle in for a meal of Kiwi fine-dining, hand-prepared on board. Then comes the piece de resistance: the morning sunrise. Be sure to get up early and hit the deck to spot the dolphin pods floundering in the sparkling waters below! Combining all the bonuses of an overnight trip on the Milford waters with a jaunt onto the legendary Milford Track hiking path, the Wanderer cruise promises something a little closer to the wild nature of the Fiordland. Travellers can spend the first day on the boat, spotting fur seals and snapping shots of the wispy waterfalls in the distance. Or, they can opt to head for the shores via a transfer to Sandfly Point. There, guided walks (included in the package) take folk deep into the water-doused canopies, where moss-caked rocks, primeval forests and blooming ferns mix with parakeets and mountain parrots. Then, it's back to the comfort of the ship and the warmth of those twin-share cabins, for a three-course evening sit down and the prospect of hitting the rollers of the Tasman Sea in the morning. Nice. 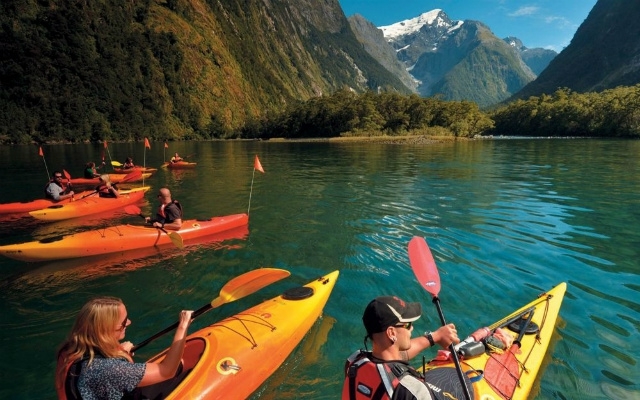 If you don't mind getting up-close to the icy salt spray of the Milford Sound, then a bout of cobweb-busting sea kayaking on the great fjord might just be the thing for you. There are several different packages available, each with dedicated guides who know all the ins and the outs of the attraction. That means getting some of the best broadside views of the snow-mantled Pembroke Glacier. It means finding secluded beachfronts for those picnic lunches. It means feeling the drifting mists fresh from the Lady Bowen Falls. Sea kayaking packages can last anything from two hours to five hours, and typically only run between November and April. There's arguably no better way to experience the real wonders of South Island's legendary Milford Sound than by hitting the waters and drifting down its length towards the Tasman Sea! What are you waiting for?